Lucky You revolves around poker champion Huck Cheever (Eric Bana) who begins to question his life when he believes that he is heading down the same track as his father (Robert Duvall), also a poker champion who abandoned his mother and Huck. Cheever, a so called ladies man starts to fall for Billie (Drew Barrymore) and ironically on their first date, Huck takes Billie on a poker date which is also a tutorial for the viewers who do not know the rules of poker. In order for Huck to be eligible for the World Series, he needs ten thousand dollars to compete and starts going down the path of his father as he becomes involved in the underworld of poker, meeting a scam artist and money man who promise our hero the money needed to enter this tournament. 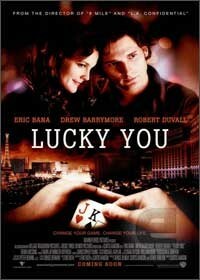 Unfortunately for Lucky You, the plot is rather boring and suicidal and in the end, the movie is more about poker than its characters. The actors do try to salvage the plot as best they can but in the end, the movies read likes a bad hand of cards.